Which leadership quality can boost performance levels to new highs, yet drive them into the ground if overused? The answer is empathy. In the new Harvard Business Review title HBR Emotional Intelligence Series: Empathy, leading experts share how empathy can be used as a powerful leadership tool and a critical component of emotional intelligence that must be understood, nurtured, and protected. With self-awareness and effort, individuals can learn to make good use of empathy to benefit themselves, their organizations, and the world. Empathy is a key component of emotional intelligence. As a characteristic and skill based in self-awareness, empathy contributes to an individual’s emotional intelligence. Empathic leaders are natural leaders. Individuals with empathy naturally emerge as leaders in every aspect of their lives, regardless of their formal positions. Empathy can be developed. Empathy begins with self-awareness, then extends to a focus on others. Individuals can work toward becoming more self-aware, and thereby increase their capacity for empathy. Empathy plays a very important role in the workplace. Empathetic leaders build trust and loyalty among their employees and increase employee well-being–all of which contribute to higher levels of performance. Empathy is finite, and must be protected. Exhibiting too much empathy can result in burnout. Individuals must avoid overextending their use of empathy to ensure their capacity for empathy is not depleted. In 13 Things Mentally Strong People Don’t Do, author and therapist Amy Morin presents the 13 most important things that people who are emotionally on top of their games do not do. No one does everything right all the time, but by acknowledging all 13 of these behaviors, actions, and feelings, people can make significant progress in their lives. Mentally strong people have better chances of success, develop better relationships, and are generally happier and healthier. Waste time feeling sorry for themselves. This is a self-destructive behavior that leads to more negative emotions. Give away their power. People can still be kind while demanding that others respect them. Shy away from change. Change can be scary and uncomfortable, but it is necessary for growth. Focus on things they cannot control. Trying to manage what is out of one’s control just leads to increased anxiety and stress. Worry about pleasing everyone. Conflict and confrontation are often uncomfortable, but constantly avoiding it makes it impossible for people to reach their goals. Fear taking calculated risks. Sometimes people’s fears and anxieties do not actually match the risks they are taking. Dwell on the past. Self-reflection can be healthy, but dwelling can be self-destructive. Make the same mistakes over and over. Repeating the same mistakes does not change anything. Resent other people’s success. Resenting someone else’s success can cause a person to behave illogically. Give up after one failure. Some of the most accomplished people in the world failed dozens of times before achieving success. Fear alone time. Creating time to be alone with one’s thoughts is a powerful experience. Feel the world owes them anything. A sense of entitlement does nothing but anger others. Expect immediate results. Change takes time. In Becoming a Resonant Leader, Annie McKee, Richard Boyatzis, and Frances Johnston describe how the most capable leaders have resonance, the ability to employ emotions effectively to achieve success while remaining attuned to the feelings and perceptions of others. Intellectual and technical knowledge are critical to effective leadership, but leaders’ abilities to manage themselves and connect with others are even more important. This is why emotional intelligence facilities like self-awareness and empathy are so valuable in relating to and communicating with others. The most effective leaders exude optimism and hope—feelings that are easily transmitted to others. Subordinates are quite aware and receptive to these positive sentiments and respond in kind, becoming more energetic and productive in the process. Resonant leaders have an accurate sense of themselves. This includes clear insights about what they are good at, what is difficult for them, and what they need to learn to achieve their optimum performance. The best leaders possess strong social and emotional intelligence. This means that they are able to manage themselves and connect effectively with others. People are constantly assessing their leaders and trying to understand them. This is why it is important for leaders to be aware of changing emotional realities in their groups and relationships. Good leaders are not necessarily those that appear impervious to stress. Good leaders reevaluate themselves periodically and undergo renewal in order to address their tasks with greater skill and energy. Resonant leadership requires a solid understanding of how social systems and the people who occupy them have to work together to achieve complex objectives. Politics exist in organizations of all sizes. This is because people by their very nature are political animals that constantly engage in power-seeking behavior. When not fully understood, the politics at play in professional relationships can prevent a person from achieving success. In The Office Politics Handbook, author and political scientist Jack Godwin, PhD, examines the role power and politics play in all social relationships. Through an exploration of political theory and examples of eight different politically powerful archetypes, Godwin offers readers tools to gain more power in their lives and greater participation in decision making on personal and professional scales. People are political animals, therefore politics exist anywhere people are present. Politics is about power. Politics exist in any social relationship that facilitates the control of one human over another. Politics is a social affair rooted in human nature. Those who master micropolitics, or politics on the most basic and interpersonal level, do so by pushing their sense of objectivity outward into social space, and downward into their primitive human nature. The “political mystique” is composed of the acquisition of power and the distribution of power. To better understand how power is acquisitioned and distributed, it is necessary to break micropolitics into its most basic components: political structures, power instruments, and complex systems. In order for people to master micropolitics, they must first journey inward. For people to be able to gain more power in their personal and professional relationships, they must first get in touch with their inner political animals. By putting forth a political persona, people protect themselves and make better strategic decisions. Political personas are masks, or the strategic way people present themselves to the world that can be used to conceal a person’s vulnerabilities, such as their motives and interests. By mastering the eight “Gods of micropolitics” a person can learn how to win people over in any personal or professional situation. The “Gods of micropolitics” are archetypes that represent the different ways people can use power and protect themselves against an adversary. Everyone must assign themselves their own roles in life. Many people are assigned roles in life that have little significance. People must act on the foundation of freedom that is accessible to all humans to assign their own roles in life and work humbly toward fulfilling this goal. In Leading with Emotional Intelligence, Reldan S. Nadler presents a handbook filled with real-life examples and step-by-step strategies to raise Emotional Intelligence and help leaders coach their teams to become “Star Performers,” or performers with high emotional intelligence. Today, organizations are faced with complex daily dynamics that can result in chaos and low performance, even in the most intelligent workforces. This influences leadership and results in confusion, frustration, defensiveness, and over- or under-managing that affects employee performance. Ultimately, argues Nadler, the way out of this loop is to enhance Emotional Intelligence. Perusing through the Huffington Post, I came across an article on Vulnerable Leadership that speaks to the fact that leaders must have the capacity to show weakness. Many leaders feel that showing any sign of weakness is a personal failure, but having the ability to admit one’s mistakes and ask for help when needed can have a lasting positive impact on employees. It is important for employees to know that their boss is not impervious to challenges and obstacles in the workplace. Showing weakness can empower employees by showing them that successful people become successful by overcoming adversity. Asking team members for help during a project also makes them feel needed and respected. It can be difficult for management to admit mistakes and show vulnerability, but leaders today must find a way to be a pillar of strength within their company while at the same time not being afraid to show their softer side. 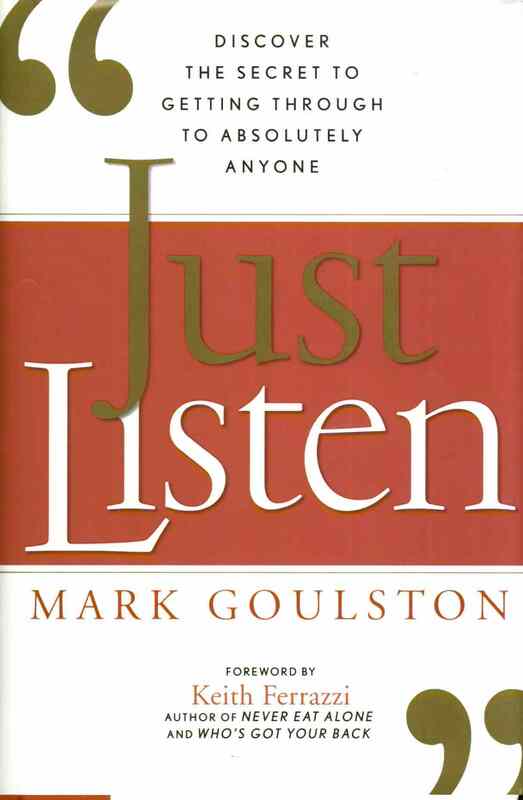 Though the seemingly simple act of communication is as natural to humans as breathing and eating, every individual occasionally runs across someone else who is not easily “reachable.” In Just Listen, author Mark Goulston explains his proven framework for getting through to stressed people in the most difficult situations. Drawing on a twenty-year-long career in psychology, Goulston sets forth the nine essential rules for getting through to anyone and supports them with twelve simple actions that get communication flowing quickly. These simple techniques are designed to pull upset, difficult people toward the willing listener, breaking down barriers in communication and opening healthy, calm, constructive dialogue. The result is a communications handbook applicable to every sector of adult life, from dealing with friends and business associates, to connecting with lovers, parents, and defiant children.